Ted, Gavin and Brandon talk about last week’s New York Comic Con in-store ticket, their secret Midtown Comics origins, go over the top ten grossing movies of the summer of 2015 and then finish it off with their top picks of the week. We also are giving away two 4-Day passes to New York Comic Con and give you details how you can win. 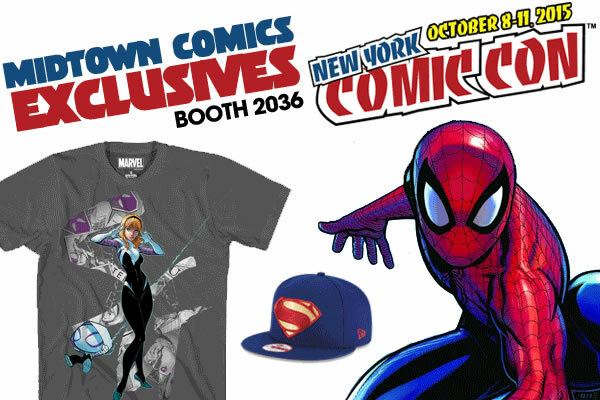 Midtown Comics at New York Comic Con 2015! Exclusives, Contests, and Photo Ops with Captain America’s shield! It just wouldn’t be New York Comic-Con without a Midtown Comics booth! This year, you can find us at booth #2036, and we’ll have plenty of fun stuff for you to check out! Not only will we have 20% off ALL graphic novels at our booth, but we’ll also have cool exclusives, contests going on during the event, and you can even pose for a picture with Captain America’s iconic shield! There will be SIX exclusive covers to buy, TWO exclusive Marvel t-shirts, THREE exclusive Batman v Superman: Dawn of Justice caps, and FOUR BVS shirts !